The Rose ringed Parakeet with the scientific name of Psittacula krameri is also known as the Ring necked Parakeet. is also known as the Ring necked Parakeet and is one of the gregarious tropical Asian parrot species which has been seen in an extremely large range. The Rose ringed Parakeet is a small parrot which has green colored body. The length of this bird is 40 cm (16 in) including its tail. Its tail covers large portion of its total length. The average wing length of this bird is 15 to 17.5 cm (5.9 to 6.9 in). The life span of this long tailed bird is 50 years. The weight of the parrots is 2.25 to 3.5 lbs (65g to 1.6 kg). The height of the parrots is 3.5in to 49 in (8.7 to 100 cm). The Parrots have very strong bills. So, they use this bill to climb trees. On an average, they live up to 25 to 30 years. Parrots come under the category of zygodactylous. The zygodactylous bird has four toes. The first and fourth toes are directed towards back ward and the second and third toes are pointed towards forward. We may differentiate male and female parakeets by using sexual dimorphism. The male rose ringed parakeets have black ring neck and pink band in the nape. This unique ring is absent in the female rose ringed parakeets. The Rose ringed Parakeets are one of the opportunistic birds. These species are able to adapt very well in all environments. They are often found quarreling around their food sources. They live as groups. During the breeding season these groups are dispersed. The nature of this Rose ringed bird is Monogamous. The flight taken by this Rose ringed parakeet is direct and strong in nature. They spend their time for climbing the tree canopies. They use their bills for climbing and other supports. The main food for the wild rose ringed parrot is seeds, fruits, nectar, pollen, vegetables, buds, arthropods and other animal prey. 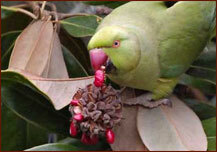 Most of the parrots are seed predators and they are not seed dispersers. This rose ringed parakeet is one of the famous pet parrots in the world. So, the main food for the pet parrots is fruits and vegetables .Variety of nutritious grains such as quinoa, oats, wheat, barley, pasta, cooked brown rice, cooked beans, lentils and peas are one of the excellent diets for this pet parrot. The Rose ringed Parakeet is commonly found in the cultivated areas, parks and gardens, trees in the countryside, dry and open forests as well as evergreen forests. We may find this species in semi desert areas and open jungles and low lands. This rose ringed Parakeet is commonly seen in large urban parks. They used to travel in flocks. They communicate by twittering, squawking or shrieking. This Rose ringed Parakeet is one of the non migrating species among the parrot. They are successfully adapted to live in the disturbed habitats and human habitats. This species is one of the noisy species and it often makes an unmistakable squawking call. These Rose ringed parakeets are commonly found in all tropical and subtropical continents. 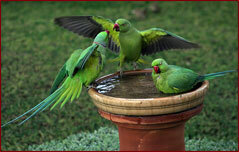 This Rose ringed parakeets are most commonly found in Asia, especially found in the India subcontinent. They are also commonly spread in the European countries like, England, Netherlands, Australia, Germany, Philippines, Surinam, New Zealand, New Guinea Japan, Oceania and Africa. They are also seen in the cities like Florida, California, Hawaii, Tunis, Tunisia, Tehran, Iran, Lebanon, Israel, UAE, Bahrain, Qatar, and Oman. Since, the Rose Ringed Parakeet is famous as a pet, these species are commonly seen in the human dominated areas. These Rose ringed parakeets are found in most of the zoos. In those zoos, they are trained to do some tricksas well to entertain the public. The pairs becomes more aggressive during the breeding period. The size of the aviary for one pair is 2 to 3 m (78 to 118 in) in length and 0.70 to 1 m (28 to 40 in) in width. The height of the aviary for one pair is 2 m (78 in). At the top of the aviary, one pair can make a nest with the size of 30 to 35 cm (12 to 14 in) in height and 30 to 35 cm (12 to 14 in) in length and 40 to 60 cm (16 to 24 in) in width. In the closed areas, the breeding season for these rose ringed parrots begins in December and in the outer areas, the breeding season for these rose ringed parrots begins in February. The female Rose ringed Parakeets lay 3 to 5 eggs at a time. The eggs of the parrots are white in colour. The incubation period for this species is 23 days. After 7 days, the young bird's feathers are completely grown and they come out of the nest and become independent after 14 days and then they leave the nest. If the first breeding is successful, then the pair will breed once more. The male parakeets become matured when they are 18 months old. But they usually breed after 3 years only. There are 350 species in Parrots. Among that 130 species are denoted as "near threatened" by the IUCN. 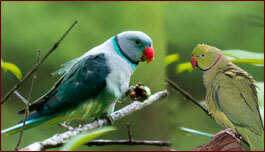 Many rose ringed parakeets are in decline and several birds have become extinct. The major reason for the threats is habitat loss, hunting, degradation, wild bird trading and so on. In some areas these species are persecuted. These birds are hunted for feathers, as agricultural pests and for food. Parrots are one of the cavity nesters. So, they become vulnerable because of the loss of nesting sites and the competition with the new species in their nesting sites. The parrots are used to living in the trees. So, the loss of trees is one of the major problem for the destruction of this species. The main reason for the threat is Pet trade also. Many parrots live only in islands. They become vulnerable due to introduction of new species in that place. Many conservation groups are present worldwide. The conservation of wild parrot population is the main goal for these conservation groups. Among that, one of the largest conservation groups is World Parrot Trust. Parrots are denoted as cultural tropes. They are the symbol of the soul, transcendence, spirits of air, ascent, communication, freedom, sight. 1. African-ring necked (aka ARN) Parakeet with the scientific name P. krameri krameri is commonly seen in West Africa in Guinea, Senegal and southern Mauritania, east to Western Uganda and Southern Sudan. 2. Abyssinian-ring necked (aka Aby-RN) Parakeet with the scientific name P. krameri parvirostris is commonly seen in Northwest Somalia, west across northern Ethiopia to Sennar district, Sudan. 1. Indian-ring necked (aka IRN) Parakeet with the scientific name P.
krameri manillensis is commonly seen in the southern parts of India. 2. Boreal or Neumann's ring necked (aka BRN) Parakeet with the scientific name P. krameri borealis is commonly seen in Bangladesh , Pakistan, northern India, Nepal and central Burma. 1. The Rose ringed parakeet perform direct and fast flight than the other parakeets. 2. The life span of the Rose ringed parakeets are about 20 years. Some of these rose ringed birds have lived up to 40 years and more. 3. These birds are seen in various colors. There are a lot of variations and mutations present in this species. Some of the birds are in one color and some of the birds are speckled due to mutation. 4. Parrots are usually bright colored birds. These Rose ringed parakeets are yellow, blue, olive, cinnamon, lutino, white, blue-white, yellow-green, and white-yellow in colour. 5. The parrots have the ability to mimic sounds. 6. These species are very intelligent in nature. 7. 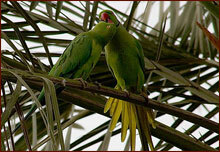 Since, the rose ringed parakeet is one of the famous pet parrot, they are very affectionate in nature. 8. These parrots are one of the famous cage birds. 9. The Parrots are omnivorous in nature. That is they eat both vegetable and meat as their food. 10. The parrots in the wild do not mimic. The cage birds are the best mimic birds. 11. The Parrots are the only birds which are using their feet to bring the food to their mouth. 12. Parrots have the ability to see Ultraviolet light.